The content of this page shows the ATR Dowpipe, ATR high flow catalytic converter and Borla Cat-Back system already installed on the car. To provide real performance gain figures I planned to add the Cat Back first and then dyno the car. Unfortunately, the stock exhaust was extremely rusty around the bolts/nuts and I was not able to remove the cat under the car :( I therefore had to remove the whole exhaust from the car in once. This is not an easy job as the stock piece is very heavy ! If you do this try to get two other hands for helping you :) You'll also need a helping hand as you attach the Downpipe/Cat combo back on. The ATR cat is a very small piece but its not feather light. 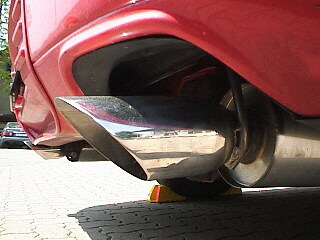 After the job was done, I was shocked and fascinated at the same time how a 6-banger Turbo engine can sound. Incredible !! 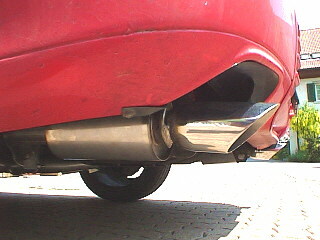 After driving it around I feel a vibration, or better said rumble, comming up from the downpipe. Around 2000-2500 it's like an earthquake and beyond this the sound become F1 character. Of course I have to retune the Blitz-Controller now to get the most out of the exhaust part. But above 3000 it feels like a somebody tikeled the Dragons tail and somebody awakes. It's a true animal! 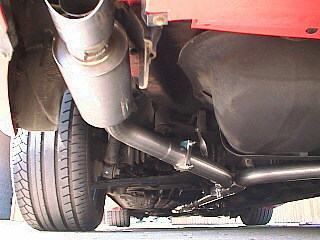 The following sections describe the installation front-to-back of the whole system after the stock exhaust has been removed. If you need any help on how to take the stock crap off, just leave me a note in my email. The ATR Downpipe is a high flowing one-piece design without flex sections like the stock piece. The quality of the the stainless steel, the bends and welds is great and it fits fine to the pre-cats. 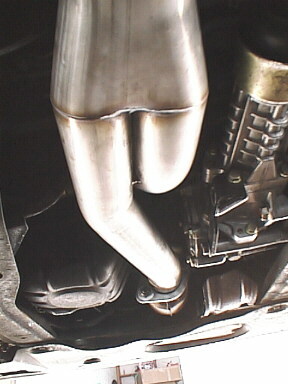 The DP comes with a small pipe that is used to attach to the stock exhaust, but when using a cat the pice must be cut. 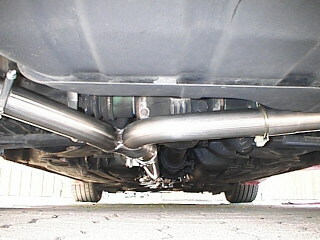 The only disadvantage is that the downpipe is about 1cm too high where it should attach the stock exhaust. But it's not a big deal as I also installed the cat-back at the same time. Before you install the DP decide if you want to go with or without the cat. In Switzerland we have to do an emmision test every two years and therefore I got the ATR high flow cat. For this I had to cut the DP about the length of the cat. At this point you also need 4 washers (not included) as the DP connection is slotted and the stock self locking nuts are somewhat small. There is enough room for them. The DP is not heavy and you can attach it by yourself. It's easier to mount as the stock one due to the flange but it took me about an hour and a lot of new learned words till it was on. The defivered bolt fits good to the hanger but the inside washer is too large in its outside diameter. Have a smaller one handy for this part. Like the DP the Cat is a 3" piece. It's very small compared to others I saw and well made. The two U-clamps look huge but came with the system. On the front (left in this picture) the Cat slips over the DP. Before you do this slot the pipe section of the Cat to have room for clamping them together. To attach the exhaust piping the ATR comes with a third part that's slips into the cat and reduces the diameter to 2 1/2". This is necessary to fit the stock exhaust or other manufactures. It's not needed if you choose the ATR exhaust. IMO it's no restriction at all although the cat is 3" it'll not flow that mach like a 2 1/2" pipe will do. I know that Steve Sullivan removed the small restriction infront of the Borla pipe (on the right side in the pic, behind the nut). Before you start check all the fittings and test-connect all parts together. Also get longer bolts and thinner washers as the delivered ones do not fit the rubber hangers. Also you'll need another 2 1/2" U-clamp as there is one missing due to a packing list error from Borla. Also you have to get two larger bolts, washers and nuts to connect the DP/Cat section to the Borla. Bolt them together after tightening the hangers. Here the parts did not fit properly on my car but as the hangers are rubber and somewhat moveable it's ok.
Now slip the y-pipe onto the intersection pipe. 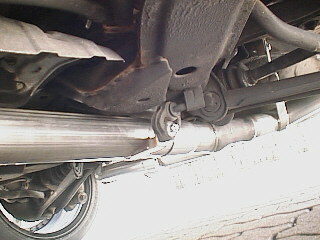 Do not tighten it as you need to adjust it for the other two muffler parts. Here the 3" pipe splits into two 2 1/2" pipes going to each side. The y-pipe has one twisted hanger. On the pic you see that it does not align perfectly with the rubber hanger. 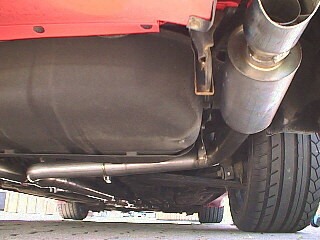 But this could be caused due to the european exhaust (no active, different design, larger muffler). So far I had no problem with this. Also note the differential and how the Borla goes around it. Use some grease to make sure to twist the y-pipe on the intersection pipe for further alignement. Now get the left muffler section. Please use a towel or something else to protect the muffler/pipe. I wrapped it around the part and secured it with a tape. They are not that heavy but there's always a danger ! Also, slip the stock rubber triangle over the hanger of the Borla muffler. Using the stock hole the alignement looks like on the pictures. This was too low for my gusto and I decided to slip the hanger into the mid of the rubber part. I like it more but it's also possible that the hanger hits the chassis. For sure there's a solution for this. 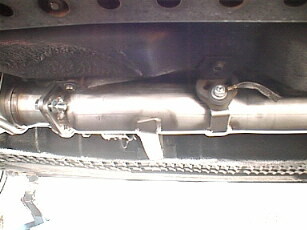 Now slip the part onto the y-pipe and reattach the two bolts to the rubber hanger part. 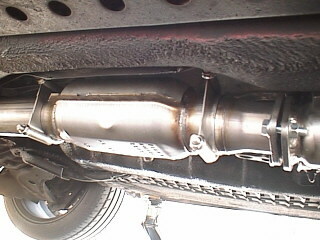 The last part to attach is the right muffler part. 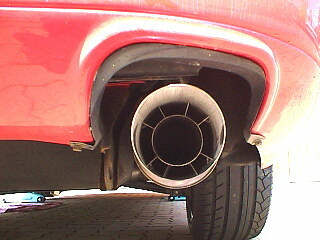 Like before prevent the tips/muffler from getting any damage. 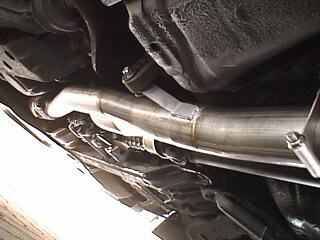 Again slip the rubber hanger part onto the Borla hanger and slip the muffler/pipe section over the y-pipe. Bolt the section onto the rubber hanger behind the wheel and reattach the two bolts of the muffler rubber hanger part to the chassis. 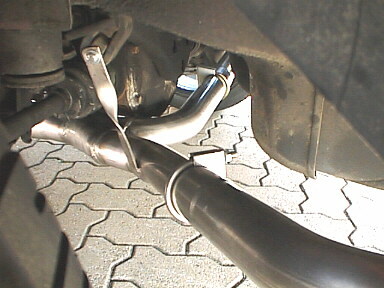 As the U-clamps have not yet be tightened and the band-clamp is not on the y-pipe you're able to twist, push, pull and whatever you want with the muffler sections. Start by doing the right side first as its location sets the position of the y-pipe (it's a 90� bend). Tighten the U-clamp a little to be able to move it still a little. Do the same procedure with the left part and close the U-clamp. If necessary you have to play a little with this until you're satisfied with the look. I this is done attach the band-clamp and you have it done! This is how the tips looked at first. It's ok but I like to have them somewhat higher. As described earlier I had to change the location of the muffler hanger in the rubber triangle for this. That's it. Turn the key and check for any leak....and then enjoy the ride. Please have the ECU relearn the changing as it looks like mine used a few miles and some rpms until it runned great again.